Hi friends, Editing this post from a previous 2014 post that linked to a Dear Stella tutorial. Including directions here on the blog now to make it a bit easier to find directions. This quilt is a fun and easy quilt that is perfect for the beginner quilter or someone that just loves a minimal look! Dear Stella fabrics - Mini Confetti Dots in Scarlet, Tomato, Coral, Shell, Blush, Pink, Peony, White. Zig Zag in Raspberry. Stella Solids in White for Binding. Print out the quilt layout if you would like to plan out your colors to help you as you sew! You will now cut all 32 - 10" background fabric squares in half from one point to the other like shown. Cut 4 - 10" heart fabric squares in half the same way. Be sure to set aside the other 6 - 10" heart squares, we will get to those later. 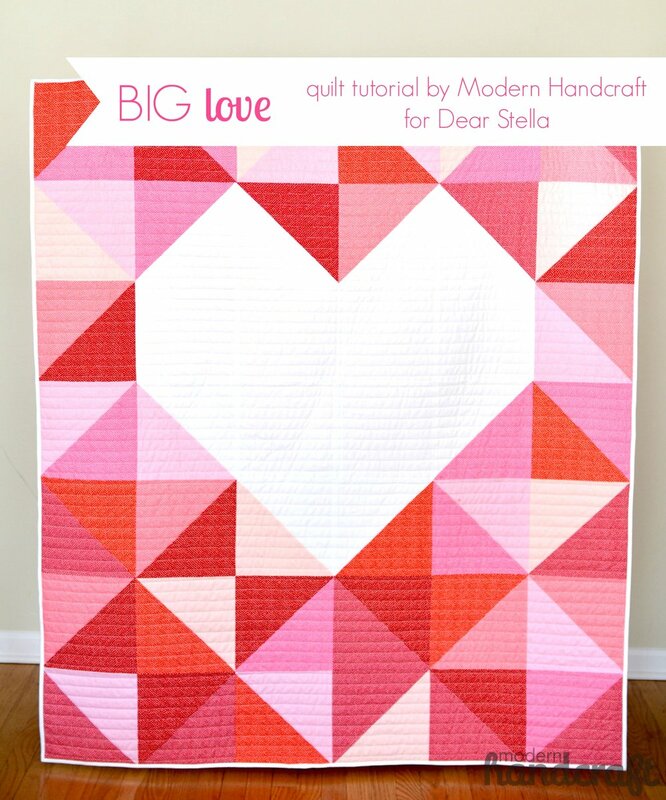 Print out the PDF Pattern for Big Love if you would like to color in the triangles with your own color choices. Click here to download the pattern in the colors I used today. I like to go ahead and choose which background fabric triangles (pink) I am going to join with my heart fabric triangles (white) You will have a total of 8 squares that will look like the above picture. You will have a total of 28 squares that will look like the picture above, these are a combination of background fabrics. It helps to design your layout on the floor next to your machine so that you can mix up your colors. You will have a total of 6 solid 10" squares, I wait to trim these until you are finished joining your half square triangles. Depending on how large you make your seam allowance can change the size of your white square. Now that you have figured out your layout you can begin sewing your triangles together. Sand which your two pieces together right sides facing and stitch together with a 1/4" seam allowance. After stitching all of your squares press open your seam allowance. Once you are finished I like to take one of my new sewn squares and lay it on top of my remaining white squares to use as a guide for trimming them down a bit from the original 10". Lay out your finished squares in your heart pattern and start sewing your rows together - after each row take to your ironing board and iron open your seams. When it is time to join your rows, find your seams and pin in place to ensure that your lines are lining up. Once finished iron open your seams and press the front of your quilt top. Baste, Quilt & Bind and you are all finished! I used a simple straight line stitch for my quilt - with the large scale of this pattern any quilting would look great! Here are some finished pictures of the quilt - Enjoy!